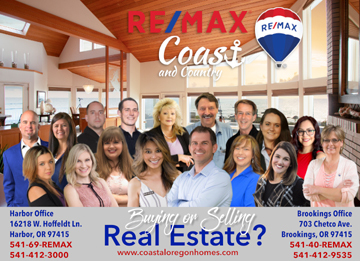 RE/MAX Coast and Country, located in Brookings-Harbor, Oregon, is a franchise division of RE/MAX International. RE/MAX Coast and Country is a privately owned Southern Oregon-based real estate company. The RE/MAX organization was created by top real estate professionals. And unlike our competitors, the founding leadership team remains intact today. We know what it takes to be a success, as our 30-plus-year record shows. Very few companies with a worldwide presence can make such a claim. Recognized by the homebuying and selling public for its red, white and blue hot-air balloon logo, RE/MAX has been the NO. 1 RESIDENTIAL REAL ESTATE NETWORK and is a LEADING INDUSTRY FORCE IN THE UNITED STATES AND MANY OTHER REGIONS. The RE/MAX name is recognized and respected by 9 out of 10 Americans; our exclusive affiliation with RE/MAX brings you the strength of one of the nation’s largest real estate service companies. In fact, RE/MAX International has grown to provide real estate services to more than 50 million people in North America and 63 countries with expansion into Africa, Asia, Australia, the Caribbean, Central America, Europe, Mexico, New Zealand and South America. The performance of our company has been unmatched. This is predicated in part to the above-average tenure of our associates and their ability to add special knowledge and experience to our firm. In an ever-changing industry, being a member of RE/MAX International gives us unprecedented stability and resources. This allows us to set higher standards for conducting business. Our talented and professional sales associates are held to the highest standard of ethics, fostering ongoing and trustworthy relationships. Keeping our Sales Associates “Above the Crowd”! As a customer-focused, quality organization, RE/MAX Coast and Country achieves success one client at a time. We emphasize local decision-making which results in the most efficient and responsive transaction. When you combine sound reasoning and extensive knowledge of the local community with the leading-edge technology and marketing of one of the nation’s largest real estate companies, you have an unrivaled resource at your disposal. You have RE/MAX Coast and Country Real Estate.